The strength of this book lies in the ordinariness of its subject. History is full of hype, stories sold as block-busters, embellished beyond plausibility, myth usurping truth.Here is a sensitive man so humble he didn't want to tell his story to begin with. Only by pure accident, he becomes the single living connection to an unimaginable experience in another time, to coin L.P. Hartley, a place where they do things differently. So he's persuaded to tell his story; understated, honest, un-heroically. This isn't any sterile, historical analyst, or fantasist Hollywood screenwriter, this is the real thing and the antidote to all that. However, if you want sensationalism, look elsewhere. And it should be explained that it isn't all about the Great War. After all, Mr. Patch is 110, that's about 105 years longer than that war lasted. Sadly Harry Patch died in July 2009 which prompted me to finally read this book that I purchased earlier in the year. Reading his memories of his life and anecdotes from those that knew him shows a truly wonderful man who cared about everyone around him. It's amazing what he could remember and that at the age of 108 (when he wrote the book) he had such a clarity of mind. I have to confess that at times I had tears in my eyes knowing that Harry had just passed on. If you want to read about a real hero then this is the book for you. This book held a very interesting topic on the life of one Englishman who served his country well. Mr. Patch never wanted to be a soldier; but, when he was called upon he didn’t schlep his responsibility to the need of the time. Born at the end of the Victorian era; he was raised in an Edwardian time; a time that has long left us here in the 21st century and the England to which he was born, raised, and lived has long since become a different nation all together. Mr. Van Emden is an effective researcher and I speculate a humble sort of interviewer in this book by rights of passages that are easily understandable. I fully appreciated the easy to read type in this book, and Mr. Van Emden’s ability to tie the story together through out. Mr. Harry Patch was quite the decent man and there are simply too many passages to call my “favorite”; however, near the end of the book Mr. Patch clearly told the author in reflection of his age and being the Last Fighting Tommy that “…my whole generation fought that war in the trenches…” Mr. Patch came to despise war and even after having two sons fight in the Second World War his disdain for war was met with the sorrow that comes with war. As the First World War was a personal touch for him and his injuries – so too the Second World War would leave the Patch family to some degree without loved ones.My interest in this book was based on the title of one British Soldier, one common ranked person who had to struggle during his time frame. I couldn’t have come across a better accounting of the time frame as a whole. The book, published in 2007 the topic and subject of Mr. Patch is born in 1898; Mr. patch would pass away in 2009 at the age 111 years young and his mental acuity intact for the age he became. The pre-war years of 1914 were quite an interesting read with occasional references to the time this was recorded for History in reflection to friends and family that were (then) in the stories of boyhood and long gone during the time of the research. Mr. Patch showed even in this late part of his life the recollections of childhood, boys getting into trouble, an education that was quite different. Before going into Military Service on behalf His Majesty and nation he earned his plumbing certification at 17.5 years of age. A skill that stayed with him for the remainder of his life serving his community and making an honest living for his family. Following the book, I finished on the Canadian Expeditionary Forces in “Merry Hell” by Captain Robert Clements (edited by Mr. Brian D. Tennyson) the dove tail effect of the battles that Mr. Patch and Captain Clements faced is rather an interesting verification of stories written. The Canadian Ross Rifle vs the British Lee-Enfield and the successful Lewis Machine Gun. Rum shots in the morning that burned going down but warmed one up were common to British, Canadian, Australian, and New Zealander troops. A touching part of this story on the battlefield is more telling when Mr. Patch wanted to stop and gain information on a British Soldier he passed before he himself was injured and the Soldier laying on the ground that he was passing enroute to battle was badly injured but still alive. As this young boy lay on the field dying and bleeding Mr. Patch could hear this lad making his last gasps of breath – taking those gasps the young man called out to his Mother, but called out to her in a manner to which she was “standing there” as opposed to “calling out for her” – Mr. Patch would never get over this experience; he wasn’t allowed to gather personal information on this boy as he wished so that he himself could have written a letter to his loved ones back in England. He would never watch a war movie nor did he later care for the entry to the Second World War. He was a man who wanted to live, experience, and share with others.This book isn’t just about war – it is about life – a life that crossed both World Wars. A life that saw many changes to his England and United Kingdom. May Mr. Harry Patch and the “Last Fighting Tommy” Rest in Peace – he lived over all a decent life; one that was committed to others. Ini merupakan sebuah ulasan buku dwi-bahasa/This is a bilingual book review. Buku ini bukanlah sebuah buku autobiografi/memoir perang yang lazimnya. Jika anda mahukan sebuah buku yang yang menceritakan keperwiraan anggota tentera menumpaskan musuhnya,dengan aksi-aksi pertempuran yang dinyatakan dengan jelas,buku ini bukanlah buku yang sesuai untuk anda.Buku ini mengisahkan Henry John "Harry" Patch,seorang veteran Perang Dunia Pertama,yang sehingga kematiannya pada 25 Julai 2009,merupakan satu-satunya veteran perang tersebut yang masih hidup (mendiang lahir pada 17 Jun 1898,meninggal dunia pada umur 111 tahun). Dengan kerjasama dan bantuan Richard Van Emden sebagai penulis bersama (co-writer),Harry Patch turut menyumbang sebagai penulis utama buku ini. Buku ini dihasilkan sebelum kematian beliau iaitu pada tahun 2007.Untuk beberapa bab awal,kita mungkin merasakan bahawa buku ini sebuah buku autobiografi/memoir yang biasa sahaja,tiada keistimewaannya. Itulah apa yang saya rasa ketika mula membaca buku ini. Tetapi,semakin lama saya membaca,semakinlah saya suka membaca isi kandungan buku ini. Apa yang menarik perhatian saya adalah betapa sederhana dan rendah dirinya manusia yang bernama Harry Patch ini. Beliau tidak mengambil kesempatan statusnya sebagai seorang veteran Perang Dunia Pertama untuk 'menjaja' dirinya sebagai wira atau hero perang tersebut. Sebaliknya,beliau lebih menumpukan kisah kehidupan peribadinya sewaktu beliau kecil sehinggalah apabila mencapai usia lebih 100 tahun.Walaupun saya tidak menangis ketika membaca buku ini,namun,tidak dinafikan,kadang-kala,timbul juga perasaan sebak. Beliau bertuah kerana berumur panjang dan menyaksikan banyak peristiwa sejarah berlaku sepanjang hidupnya. Namun,pada masa yang sama,beliau juga bernasib malang kerana menyaksikan satu demi satu,orang-orang tersayangnya meninggalkan dirinya buat selama-lamanya dan ini termasuklah tiga orang isteri dan dua orang anaknya (dari perkongsian hidup dengan isteri pertamanya yang bernama Ada). Buku ini sebuah buku mengenai kehidupan yang mengajar kita untuk menghargai kehidupan kita dan orang-orang tersayang yang berada di sisi kita. If you are looking a bravado and action-packed autobiography/memoir book of World War One,this is not a book which is suitable for you.Simply,this is a book about life,and how we must cherish it together with people around us. This is a book about Henry John "Harry" Patch,the last British World War One veteran,now deceased (2009). This book is written in 2007 by Harry Patch himself,with Richard Van Emden as co-author. This book covers Harry Patch's life chronicle from childhood until well over age 100. What made this book is so great and interesting to read is how humble his life is. Probably,like majority of World War One veterans,he came from not larger-than-life background. His life may look ordinary and mundane,but like any other men,also has its own challenges and excitement. He is destined to have a long life,which enables him to watch many histories unfolded,especially the era of 20th century. But,in the same time,he is also been condemned to watch nearly all his beloved ones,perish one by one,which includes his wives and two sons. 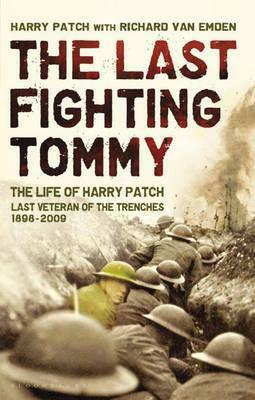 The Last Fighting Tommy tells the story of Harry Patch, the longest surviving veteran of the trenches. 2014 marks 100 years since the start of World War I so I thought now would be a good time to read this book that has been sat on my shelf for years and years. Harry Patch died in 2009, aged 111, and given that the book was published in 2007 it does cover the vast majority of his long life. As one would expect a fair chunk of the book covers Harry's experiences in World War I as he was forced to give up on his career and go and fight. The chapter about when he went over the top is mesmerising as it captures one man's experience of the horrors of the war, rather than an overview that we usually get. I think at times the man behind the project, Richard Van Emden, lost track of the purpose of the book and his sections go far too much into the detailed history than is needed. This is not a history book, it is a book about one man's experiences of history. I did think this job did a good job pretty reasonable job of covering most of Harry's life rather than just the four months he spent in the trenches. Harry told us about his whole life without boring us with every little detail- he shared what he thought would be most interesting and it works really well. There is a great section on World War II where Harry describes being a firefighter and dealing with the aftermath of the bombings on Bath. This was a well-done book which told the life of an ordinary man who lived through extraordinary things. On the one hand it is history told through the eyes of someone who was there, whilst on the other hand he represents all the men who fought in the trenches. A fascinating read. I'm pretty sure I've never read a book written by someone quite so old. Harry Patch was around 105 at the time of writing this autobiographical piece and it makes a good story. He's an ordinary man who grew up around Combe Down near Bath, but ended up in the Trenches at Ypres and then manning the firetrucks during the second world war. I really enjoyed learning about my local area in the early 1900s and finding out what shenanigans young people got up to in those days. Harry's insight into his feelings and emotions surrounding war and conflict generally are hugely powerful for such a seemingly reserved individual. What an incredible life. What an emotional,eye-opening book. I loved every page. It really makes it stand out that just because the war was declared over, it wasn't for the soldiers who went onto the battlefield. a delightful short book detailing the life of Henry Patch the last surviving British soldier to have fight in the trenches of the Great War. It is interesting to read the memoir of a man who knows he is the last survivor of his generation, and while not fully comfortable with that role, embraces it and becomes the everyman to represent all his brethren who came before him. After reading the book I have had thoughts myself what it will he like once my generation's veterans begin to dwindle. Definitely a worthwhile read for those interested in the study of World War I. "I know the first time I went to the line we were scared; we were all scared. We lived hour by hour, we never knew the future. You saw the sun rise, hopefully you'd see it set. If you saw it set, you hoped you'd see it rise. Some men would, some men wouldn't. "Some so called world leaders should read this book and realize that war leads to absolutely nothing. The story of Harry Patch and all his fellow soldiers should never be forgotten. I loved this book! I had watched a series in which Harry appeared which prompted me to read it. I have lived in the area that he lived in for several years and have family there so I was able to picture a lot of the settings. He seemed to be such a great gentleman and representative of a time gone passed. The Last Fighting Tommy is an interesting book about a remarkable man, Harry Patch.Harry was the last remaining British soldier to survive the Western front. He passed away in July 2009, aged 111 years old. Over 90 years ago, he was sent to fight in the mud and blood of Passchendale.That Harry managed to live so long seems particularly incredible when you read that he had an 2 inch lump of white hot shrapnel blasted into his guts. Meamwhile, all around him his comrades were being blown up. This book is more than another account on WW1 trench life, this is Harry's story. There are no heroes or cowards, there is no patriotism and little bitterness. This is one mans story of how he did his duty and how awful it was. The strong message that this story carries throughout is purely and simply of the futility of war. The heartbreaking passages about his doomed Lewis gun crew, and how they found deep friendship and comradeship are beautifully told. We also hear about his early days in rural Somerset, his long and distinguished years as a master plumber/engineer, and his family life with its ups and some very big downs.Author Richard Van Emden worked meticulously with Harry to produce a very moving account of Harry's life, including the hellish conflict of 1917. Harry Patch lived during both World Wars and was actively involved at the Western Front during the first war.He was the last surviving Tommy and fortunately for us his story has been written down.The humor and seriousness with which he tells his story in the village of Bath, where he grew up, how the villege prepared for war and how he went to war. His life with his first wife and after that are hard to read, while some of his anecdotes make you laugh too.When I was reading his story, I wanted to thank him for his help during the war in my region in Belgium. As it was for him hard to go back to Ypers, Poperinge, .... aroud 2000 and see the places where he fought in the trenches, visiting the graves of thousands of people who fought and died there...it was hard for me to read it sometimes.Harry Patch sound like he was a really nice person, somebody I am sure I would have having known. Harry Patch is 109 years [110 in June]. He is the oldest surviving man who saw combat in World War 1.Harry didn't want to fight[he'd trained a a plumber] but still did his duty in the horror of the trenches - fighting at the famous Battle of Passchendaele.This book takes you on an historical journey through the life of an ordinary man who, as time has moved on taking his contemporaries one-by-one, has become extraordinary. By default he has outlived his comrades and his enemies and many of his loved ones. Whilst uplifting the book is also tinged with a certain sadness.The book is part historical narrative and part simpl-conversational style.It is a very easy read the sort of book that should be given to all children to read... and many adults too. It may teach people a great deal about social history, you never know it might even teach tem a thing about respect too.God bless you, Harry Patch. Harry Patch was something of a local celebrity. And hardly surprising really. He was born and brought up in Combe Down in Bath, so the book is littered with local references, which made it all the more enjoyable for me.Rather than just tell of Harry’s experiences in WW1, the book is his history from the day he was born (in 1898) until 2007. He lived through two wars and lived through three centuries. It’s humbling to think of that.Harry was present at the service of Remembrance at the Royal Albert Hall in November 2007. According to our local paper, he was going to spend the following day (Remembrance Day) in quiet reflection at his nursing home in Wells - and who can blame him.I really enjoyed the book (aside a few spelling mistakes for place-names, which the co-author could have checked out really easily. Harry’s book deserves better). Harry is a legend. What's fascinating about this dictated autobiography of the last living British veteran of the trenches of World War I is how little time he actually spent in the war. As of the writing, Harry Patch was 108 years old. His time spent fighting, before being wounded and shipped back to England, totaled little more than four months. Rather, his longevity and his ease in front of the camera brought fame in his later years. The war was something that happened to him and to everyone else. War is something that Patch speaks against in his remembrances, its pointlessness and waste. The darkness of the trenches stands starkly against the near idyllic and pleasant Edwardian childhood he describes in the opening chapters. This is an interesting book for those interested not only in the Great War, but those interested in the everyday and the personal. A great read with some lovely humour too. Very moving and inspiring because he was, like most Western Front veterans, just an ordinary man who served his country in an extraordinary way. Two aspects of his life geographically struck me. Firstly, his home village was just a few miles from my maternal grandfather's ancestral home a generation or so earlier. Secondly, my paternal Grandfather also served on the Western Front in the 38th Welsh Division. Harry's 20th Division & the 38th relieved each other at Pilckem Ridge and Langemark and fought on the same section of ground at the start of Passchendaele. So some things he witnessed would have been experienced by my Grandfather too. Maybe I expected more than this could deliver. The fact that it is only approx. 25% on WWI is both a plus and a minus. I was expecting more information, first person accounts of the trenches. Yet it is also true that a lot of the other info from the early 20th century is pretty interesting. It is the quotidian nature of much of what is here that is its charm. But it also limits its appeal as much of it could be viewed as a bit mundane.So I'm in two minds. There is nothing wrong with the book, and perhaps my expectations were misplaced. Overall it is OK, a quick read. Just don't expect lots of WWI detail that isn't really here. I was left feeling a litle disappointed by this book as I have really taken to reading accounts of the war and learning more, but I felt that this fell a little flat. It was interesting in so far as learning about an Edwardian upbringing and the context/ effects on family life at the time but I felt like it never got to the nitty gritty of war. In terms of WW2 very little was actually mentioned. By the end of the book more was actually written by Van Emden that Harry himself, giving context to his comments. He is a remarkable guy and has done wonderful things for our country but I just never quite got that 'gripped' feeling I wanted from this book. A wonderful book for those with a knowledge of the Bath area and an interest in the Great War. Harry Petch came from Combe Down in Bath and as a teenager was wounded at Passchendaele. His family was relatively prosperous and he had a good life as a plumber. He was in the AFS in the Second World War experiencing the Bath Blitz when 400 people died in a Baedeker Raid. It wasnt till he got to a hundred that he started talking about his experiences in the Great War and he became a national figure portrayed on TV and in poetry. He died aged 111 this year. I loved reading this book and was disappointed when it came to an end. Harry writes with such humility. His stories are factual and not embellished or given the "hollywood" bling. He tells the story of his life as he experienced it from boyhood, through the first world war in active service, his contribution during the second world war and how his life and loves developed until the end of his days. He must have been a truly inspiring man to have met. His spirit shines through the pages. I would highly recommend reading this book. The story of Harry Patch is fascinating, poignant and humbling. Told biographically through a series of interviews with Richard Van Emden, the writing is frank and descriptive without ever straying into hyperbole. We get a glimpse into childhood life in the west country of England, both World Wars, and a lifetime of experiences spanning a century. The horrors of war certainly marked Harry's life, but never dominated it. Love, acceptance and forgiveness all play a part in his story. The matter-of-fact tone emphasises how lucky many of us are, and how we should never forget. This book tells the Story of Harry Patch, last surviving British soldier who fought in the trenches during the Great War. It is more than a war story as it begins with his childhood growing up near Bath, England. The book was published when he was 108 years old and is remarkable in the detail for one of such an age. His co-author, blends the historical details of the times smoothly in to Harry's retelling of his memories. He died at the age of 109 having chosen to forego any pomp and circumstance in his burial as the longest surviving Tommy. What a truly inspirational read. Having met the late Harry Patch at the naming ceremony of the lifeboat named in his and Doris's name, it was fascinating to read more about him. His famed age, iconic presence as "the last fighting Tommy" and his philanthropic gestures are just a snippet of Harry's life and van Emden's touching narratives add more depth. TLFT should be read as a guide to social history covering the innocence of a bygone age, one we strive for today but as a reminder of the personal horrors that war can deliver without discrimation. I write this with a tear in my eye. I have just finished this wonderful book. A simple story elegantly and movingly told of a man, who is defined by his experiences of being a WWI trench veteran, but who was much more than that. The tears were due to the simple but wonderful telling of a man's life. He has gone now, to join his comrades from the Vickers gun team perhaps, whose to say; but as we tell ourselves, we should never forget. We must never forget what our forefathers did for us.